Bungie have kept their promise of making the upgrade path for old gear as simple as possible in House of Wolves. Players who hate grinding will love the new system which requires only Etheric Light to boast their new and old gear to the new Attack and Defense stats. This simple upgrade path applies to ALL non-exotic weapons and armour, even those which pre-date The Dark Below. 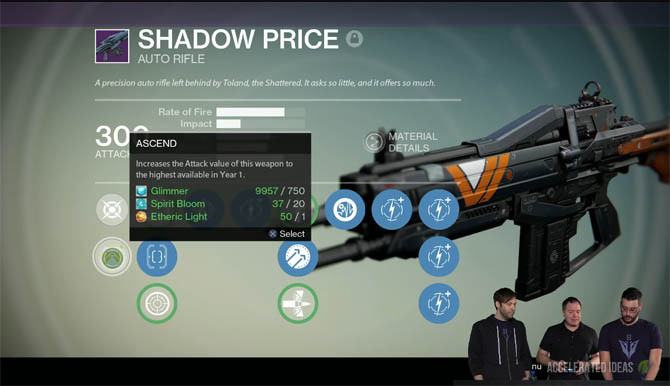 So think Shadow Price and you've got a nice new "Ascend" upgrade slot which takes the weapon straight to the maximum Attack value. What's also great is that even without the DLC you can still upgrade your weapons to the new higher values! First let's take a look at the new upgrade path for gear in House of Wolves. You should all be familiar with the old upgrade path (pre-House of Wolves) where you upgraded each of the slots in the upgrade tree to reach the maximum level. This required some planetary material, glimmer and weapons parts (for weapons) and other class specific upgrade materials for armour. It also caused some considerable pain while you unlocked each of the upgrade slots all over again. The main difference between the two is that one is used to boost (or Ascend) non-exotic gear whilst the other is used primarily for Exotic gear. More of that below. To actually upgrade an item you simply open the item in your inventory and you'll notice a NEW upgrade slot in the upgrade tree. This slot has a shiny Gold/Yellow colour and is located on the far left hand side, just under the damage type slot. Hover over the slot and you'll see the requirements which will be some kind of planetary material, glimmer and Etheric Light. If you've met the requirements then just select the slot to instantly upgrade to the new maximum value. What is Etheric Light and where to find it? Etheric Light is a new material in the DLC, required to upgrade your weapons and armour to the new maximum stat. In the case of weapons this will be Attack 365. So where do you find this new illusive material? 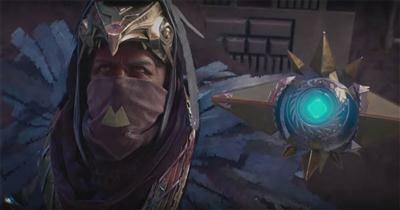 Well, it's all about the end game elements from the original game and some that Bungie have added in this expansion. Upgrading Exotic items doesn't require Etheric Light. Instead you only need an Exotic shard which can be bought through Xur (at the weekend) or gained by dismantling Exotic weapons or armour. The same Ascend tree slot will appear when you view the Exotic item in your inventory. So long as you have the upgrade materials you can select the slot to instantly move to the new higher value. First let's look at weapons. The Dark Below DLC allowed players to upgrade weapons to a maximum Attack of 331. This value is surpassed in the House of Wolves allowing players to reach Attack 365 if they upgrade using Etheric Light and have maxed out all the upgrade slots. This also applies to Exotic weapons which can also reach the same 365 value by using Exotic Shards to upgrade. On the armour side, each of the armour types e.g helmet, chest, gloves, boots, have their own maximum Defense value but they all have a maximum Light stat. When you tally up all the Light stats across these four armour types you will reach a maximum Light Level of 34 for your character. This is the new maximum Light Level in the House of Wolves DLC.